Ekiti Guber Elections : INEC assures fair outing as stakeholders’ meeting end abruptly – Royal Times of Nigeria. 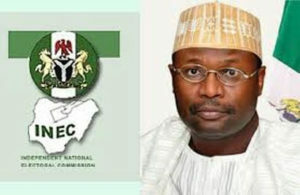 Ahead of Saturday’s governorship election in Ekiti,the Chairman of the Independent National Electoral Commission (INEC), Professor Mahmood Yakubu today assured the electorate that their votes will count. Yakubu stated this at a stakeholders meeting held in Ado-Ekiti which had in attendance some of the gubernatorial candidates and their party officials. The INEC boss also informed that commission has trained all the ad hoc staff required for the election while it has made adequate arrangements for the delivery of personnel and materials to all polling units. Meanwhile, the stakeholders’ meeting tagged: Ekiti Stakeholders Meeting, which was attended by the candidates of the 35 political parties, ended in an uproar as members of the All Progressives Congress (APC) and the Peoples Democratic Party (PDP) threw jibes at each other leading to an abrupt end in what eyewitness described as show of strength.